Hello, it's late but I thought I'd jump on here with a quick update. 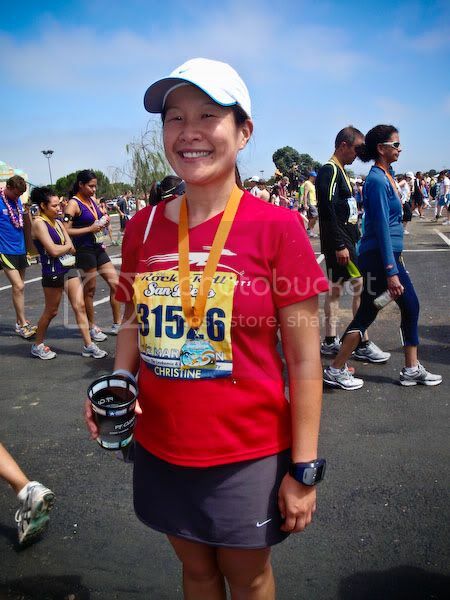 I ran and finished the Rock N Roll San Diego Half Marathon in 2:33:06 today. :) (I beat my last year's RnR Seattle Half Marathon time of 2:40:36.) I was very excited to finish since my legs were so tired and it was sunny and muggy and I felt totally drained. I'll have a full race report with photos tomorrow. I had to get up at 3:30am today to make it to the race, so I'm totally pooped out and heading to bed right now. You are the coolest! Congrats to you...now go eat a giant hamburger, fries, and some sort of ice cream dessert!! Congratulations - to finish and still have the muscles to muster up a huge grin like that makes me think a very good race report is coming. Can't wait to read it. Congrats! We must have finished quite near each other! You look much happier than I felt at the end. It was HOT!